Table 1. Minimum recommended soil pH levels for pasture plant species commonly grown in western Oregon and western Washington. Figure 2. Visual guide for grass: legume ratio in pasture. Legumes contribute plant-available N, so N fertilizer applications can be reduced as the percentage of legume increases. Photos: Amber Moore, © Oregon State University. Figure 3. Forage dry matter yield response to N fertilizer in irrigated grass/legume pastures. Pastures were grazed by beef cattle three or four times annually. Approximately half of the annual forage dry matter yield was produced by a hay crop. Data collected at field sites near Ogden, UT. Adapted from Koenig, et al. (2002). Figure 4. Pasture N calendar. Additional applications for irrigated pastures are indicated by dashed lines. This calendar is only an approximation, based on typical climatic conditions of pasture production subregions in western Oregon and western Washington. Other site-specific factors should be considered when determining the exact timing of N fertilizer application, as described in the “Time of year” section. Table 3. 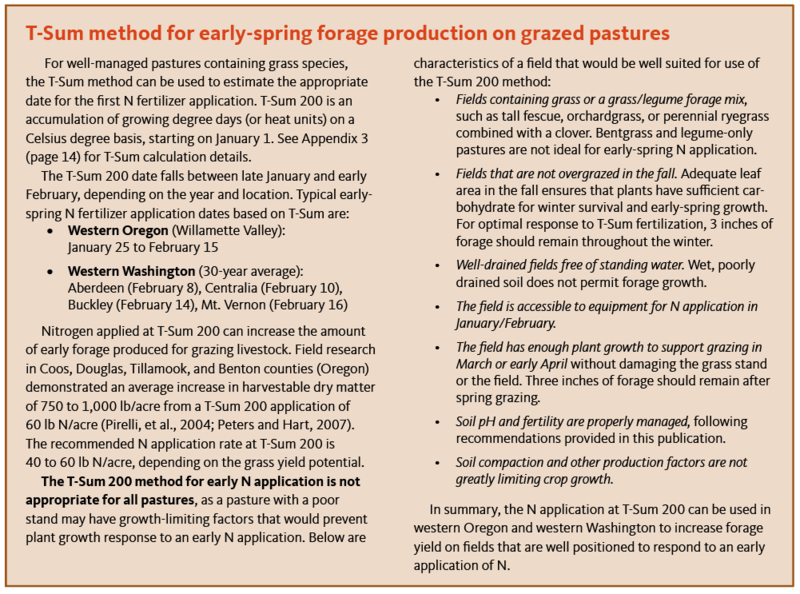 Annual nitrogen recommendations for grazed pasture systems in western Oregon and western Washington, based on realistic yield potential and plant composition. Table 4. Phosphorus application rates for pastures. Table 5. Potassium application rates for pastures. Figure 7. 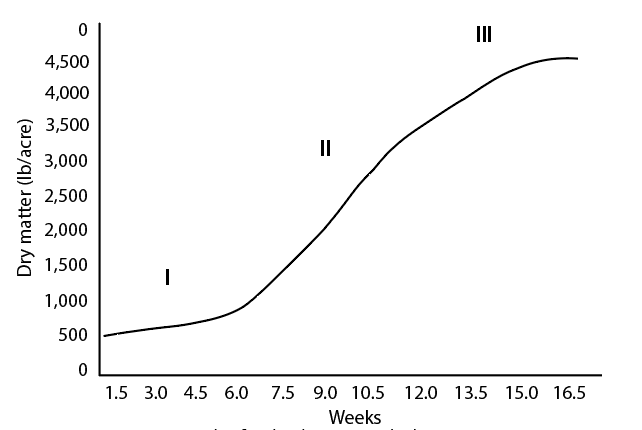 Example of orchardgrass growth phase response to time. Data collected at Monmouth, OR, March to July 1985. Data from G. Pirelli. Forage production is of primary importance to livestock enterprises and the agricultural economy in the Pacific Northwest. When properly managed, pastures can produce forage for pennies per pound of dry matter and can serve as the main feed source for western Oregon and Washington livestock operations. Good soil fertility is an essential part of a successful forage management program. Science-based nutrient management, combined with a dense stand of grass or grass/clover species, can provide a sustainable source of forage. This publication provides nutrient management concepts and recommendations for western Oregon and western Washington pastures used primarily for grazing. It also includes concepts related to conserving forage as hay or silage when forage production exceeds grazing needs. The topics discussed in this publication will help livestock producers develop a sustainable forage production system. Nutrient management practices may not be beneficial unless system-wide best management practices for pasture systems are implemented. Animal management practices have a tremendous influence on pasture productivity. Poor management practices, such as overgrazing and grazing animals on saturated soils, will greatly reduce or even eliminate the positive effects of soil fertility improvements. Therefore, a secondary goal of this publication is to address general pasture management practices that may affect the pasture’s ability to respond to recommended nutrient management practices. Species composition: A dense stand of cool-season pasture grasses (e.g., tall fescue, orchardgrass, perennial ryegrass) and a clover species (e.g., white clover, subclover, red clover) will respond well to nutrient applications, assuming that the soil pH is appropriate for the species in the mix. Plant density: Early-establishment stands will likely be thin. As the pasture stand ages, tillering increases in grasses and branching increases in legumes, resulting in a denser stand. Younger, thinner stands are subject to weedy species invasion, while aged, dense stands provide a more competitive environment against invading weeds and native grasses. Stage of growth: Plants in the vegetative growth phase with adequate leaf area are more likely to show a response to a nutrient application than are overgrazed plants or plants that are close to maturity. Pasture plants are classified as being in growth phase I, II, or III, with phase II being the optimal phase for fertilizer application. Further guidance on how to adjust fertilizer applications and grazing management based on growth stage is provided in Appendix 1. For more information on managing plants in pasture systems, see The Western Oregon and Washington Pasture Calendar (PNW 699). Stand age: The longer a pasture plant is present in a stand, the older are its genetics. Plant breeders have focused on genetic improvements that allow new forage cultivars to outperform older versions of the same species in growth rate, yield, digestibility, and other attributes. When a new stand is established, the resulting increase in pasture productivity may also promote an improved response to fertilizer applications. Balance of soil nutrients before N applications: If pasture soils are very low in an essential nutrient, forage yield will be limited by that nutrient even if other nutrients are applied. For example, if phosphorus (P) is the most limiting factor in a pasture, nitrogen (N) application will not provide the expected outcome. To get the best response from N applications, make sure all other essential plant nutrients are at recommended levels. Amount of defoliation by grazing animals: As animals graze the forages in a pasture, plant regrowth replaces the consumed forage. However, excessive defoliation caused by overgrazing will slow the rate of regrowth and will prevent plants from effectively using N and other critical plant nutrients in the soil. Soil nutrient testing is essential to determine the amount of nutrients available in the soil for plant growth and how much fertilizer is needed to optimize forage yield and quality. For new, conventionally tilled seedings, test the soil prior to planting. For established and no-till pastures, plan to have soil analyzed every 2 years if fertility is within recommended levels. Test annually if fertility is below recommended levels and nutrient deficiencies are common. Collect the samples near the same date each year, since nutrient levels vary seasonally. Collect samples from the tillage depth, about 6 to 8 inches for pastures in this region. For complete instructions on how to take a soil sample, see A Guide to Collecting Soil Samples for Farms and Gardens (EC 628). Additional information on soil sampling frequency and the management unit approach can be found in Monitoring Soil Nutrients Using a Management Unit Approach (PNW 570). For fields that have been established for more than 5 years and for no-till systems, a stratified sampling approach provides additional information for long-term management. Dividing the sample into two parts, surface to 2 inches and 2 to 6 inches, for separate analyses can reveal accumulation of less mobile nutrients near the soil surface. To learn more about the stratified sampling approach, see Evaluating Soil Nutrients and pH by Depth in Situations of Limited or No Tillage in Western Oregon (EM 9014). In fields where clover and other legumes are grown, also analyze for hot-water-extractable boron (B). Soil testing for nitrogen (N) and sulfur (S) in pasture systems is not recommended, as these tests are poor predictors of the plant availability of these nutrients. When selecting a laboratory to analyze samples, contact the lab to confirm that they do the recommended tests and to determine shipping and handling procedures. To find a lab specializing in soil testing, refer to Analytical Laboratories Serving Oregon (EM 8677). A current list of soil testing labs that are accredited through the North American Proficiency Testing Performance Assessment Program (NAPT-PAP) can be found at https://www.naptprogram.org/pap/labs. Soils in western Oregon and western Washington are naturally acidic. Repeated applications of ammonium-based N fertilizers can contribute to additional soil acidification. Soil pH is a measure of soil acidity. Acidic soil conditions occur when soil pH levels are below 7.0. Soil pH decreases with increasing acidity. As soils become more acidic, forage yields are reduced due to a combination of nutrient toxicities (aluminum or manganese) and nutrient deficiencies (P, K, Ca, Mo, or N). Highly acidic soils greatly limit the effectiveness of fertilizer applications, as chemical and biological processes in the soil prevent many nutrients from being in a plant-available form. The recommended minimum soil pH for most grasses and legumes grown in pasture systems is between 5.5 and 6.0, depending on the plant species. Minimum recommended soil pH values for specific species are listed in Table 1. Some plants may persist below these soil pH levels, depending on factors such as soil type and rooting depth. However, when soil pH is below recommended levels, forage yield and quality can decline dramatically in response to even a minor decrease in soil pH. Plant species shift can also occur at pH levels below 5.5, with acid-tolerant grasses such as bentgrass persisting over less acid-tolerant plant species such as white clover and orchardgrass. To learn more about general concepts related to soil acidity, see Soil Acidity in Oregon (EM 9061). The most cost-effective method for correcting soil acidity is lime application. Lime products originate from ground limestone, which is composed of calcium carbonate compounds. The Ca ions from lime replace acidifying H+ ions on soil particles. The carbonate compounds then react with the replaced H ions to form water and carbon dioxide, thereby decreasing the proportion of H ions in the soil and raising soil pH. Calcium alone does not increase soil pH, so gypsum (CaSO4), CaCl2, CaNO3, and other soluble Ca products are not recommended for addressing soil acidity issues. Lime applications are often considered to be one of the most important management practices in a productive pasture system. Research conducted in Tillamook and Lane counties in Oregon showed a yield increase of 1,000 and 3,000 lb forage/acre, respectively, when lime was top-dressed at a rate of 2 ton/acre (Rogers, 1995). The effects of a lime application may last only 2 or 3 years. Therefore, plan to apply lime regularly to maintain forage quality and yields. Lime applications are costly, and growth response to lime may take between 6 months to a year. To reduce yearly cost, apply lime to one or two fields each year. Avoid spreading a small amount of lime over a large number of fields, as applications of less than 0.5 ton/acre may be too small to significantly increase soil pH. Think of lime as an “investment” that will pay back over many years each time livestock graze and with each hay or silage harvest. 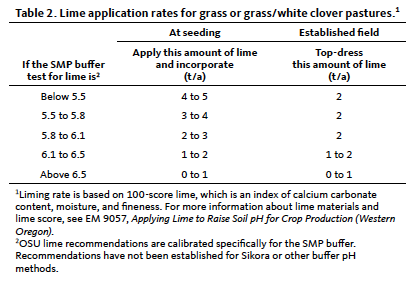 Lime application recommendations are based on SMP buffer test results. Follow the guidelines in the soil testing section of this guide to determine the appropriate soil sampling depth for your specific pasture conditions. Apply lime to grass and grass/clover pastures if the soil pH is below 5.5. Use the soil test SMP buffer value and Table 2 to determine the amount of lime required. Note that lime application rates are reduced for established fields to avoid smothering plants with the lime material. The lime recommendations in Table 2 are based on a target soil pH value of 5.8. For fields with less acid-tolerant species, consider using the upper end of the recommended lime application rate. If it is cost-prohibitive to add the recommended amount of lime, even a lower lime rate of 1 to 2 ton/acre will be beneficial. To ensure adequate soil pH for several years and to avoid the need for a top-dress lime application, a reasonable approach is to raise soil pH to 0.2 to 0.3 pH unit above the recommended minimum pH level in Table 1. To achieve this goal, increase lime application rates by approximately 0.5 ton/acre above the recommendations in Table 2. For new seedings established with tillage, preplant application of lime to bare soil is the most effective application method and produces the fastest response. The material can be thoroughly mixed into the soil ahead of planting so that it has time to react and change the pH throughout the tillage depth. In addition, a large amount of lime can be added during field cultivation, thereby quickly raising a low soil pH to desired levels. For existing pastures or no-till pastures, top-dress lime before fall rains begin and soils become muddy and waterlogged. During the first winter, lime will move only about 1 inch below the soil surface. When top-dressing, apply no more than 2 ton/acre of the appropriate lime source to avoid smothering or injuring plants (Table 2). Top-dressed lime applications above 2 ton/acre will produce little or no additional soil pH or crop response (Rogers, 1995). Avoid grazing livestock on recently limed fields, as lime materials can cause eye injury and respiratory issues. To avoid this risk, producers often delay grazing until the spring following a lime application. Calcium is needed by plants to support cell wall structures, while Mg is needed for chlorophyll and protein synthesis. Calcium and Mg usually exist in the soil in adequate quantities when soil pH is above 5.5. If the Ca soil test is below 1,000 ppm (5 meq Ca/100 g of soil) and soil pH is above 5.0, add 1 ton lime/acre. 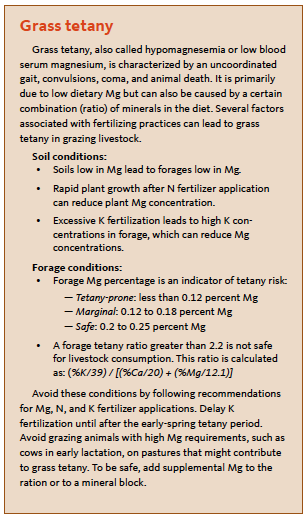 Maintaining sufficient levels of Mg in the soil is especially important in pasture systems to prevent grass tetany, a livestock disease caused by Mg-deficient forage. When soil requires lime and is low in Mg (less than 100 ppm or 0.8 meq Mg/100 g of soil), use 1 ton/acre dolomitic lime as a source of both Ca and Mg. Dolomitic lime and ground limestone have about the same ability to neutralize soil acidity. If lime is not needed and Mg levels are low, apply K-Mag (21% K, 10% Mg, 21% S) at a rate of 500 lb K-Mag/acre. For more information on managing soils to prevent grass tetany, see the sidebar “Grass tetany” or visit “Spring Pastures—Grass Tetany and Bloat” at http://www.ansc.purdue.edu/beef/articles/GrassTetanyBloat.pdf. 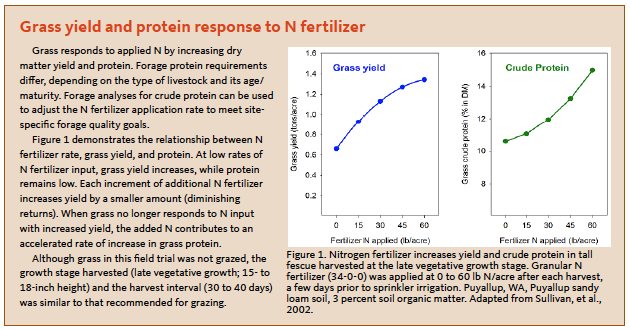 Nitrogen fertilization is an important practice in pasture production systems, as N is needed by forage crops to support plant growth, protein synthesis, and tillering (see the sidebar “Grass yield and protein response to N fertilizer”). Forage yield and feed quality are reduced when N is insufficient, while excessive N can result in forage nitrate toxicities, nitrate leaching, and production of forage in excess of what can be consumed by grazing animals. Nitrogen deficiencies in pastures often can be detected visually. The majority of the stand will appear pale green, with urine and manure areas remaining dark green. For new pasture stands, an application of 20 to 25 lb N/acre is recommended at seeding. Fertilizer N can be broadcast or banded approximately 1 to 2 inches ­below the seed. If fertilizer is banded, application rates should not exceed 100 lb N + K2O/acre to avoid seed germination issues caused by salt burn. For established fields, factors such as plant species, forage yield potential, and time of year influence the optimal amount of N required by the pasture crop to produce high-quality and high-yielding forages. See the following guidance to understand how each of these factors affects N use in forage pastures. Forage pastures are typically composed of high-yielding grasses (e.g., annual ryegrass, perennial ryegrass, orchardgrass, tall fescue) and legumes (e.g., white clover, subclover and other annual clovers, red clover, annual or hairy vetch, birdsfoot trefoil) or a combination of the two. High-yielding grasses will readily absorb plant-available forms of N (nitrate-N and ammonium-N). Low-yielding grasses, including bentgrass, velvetgrass, and rattail fescue, have naturally low forage yield and quality potential. Thus, they have a lower requirement for N than high-yielding species. 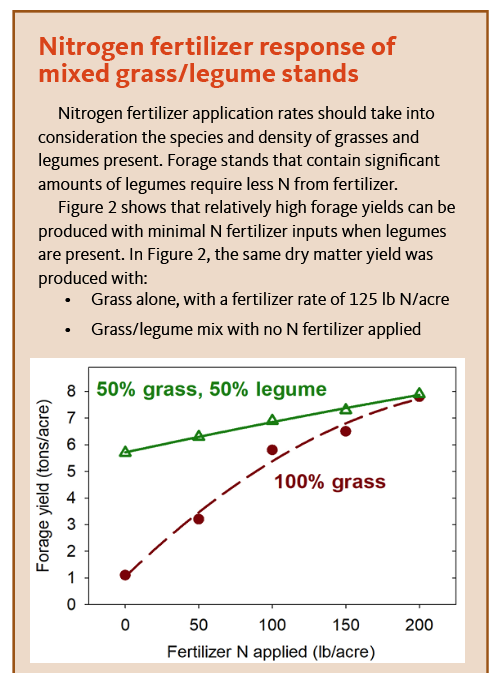 The presence of legumes in a pasture (Figure 2) reduces the amount of N fertilizer needed to support forage production. Legumes can produce their own N through the process of biological N fixation. Rhizobium or Bradyrhizobium bacteria infect legume roots, and the resulting root nodules convert N2 gas from the atmosphere to ammonium-N compounds that can be used by the plant. An example of the N contribution of legumes is shown in Figure 3. Although most pasture fields have naturally abundant Rhizobium bacteria, naturally occurring bacteria often are less efficient than those in commercially available inoculum. Thus, inoculation of legume seed is recommended when legumes are planted. When excessive amounts of N are available, N fixation is reduced, and legumes behave like grasses by using N from the soil instead of fixing N2 from the atmosphere. Applying excessive N to a mixed grass/legume stand will also shift the stand composition toward grass species, resulting in lower forage quality and increased N fertilizer requirement over time. Effective N management practices in pasture systems are based on realistic estimates of forage yield for individual fields. Each pasture has an upper limit to how much yield can be achieved. Yield potential is influenced by soil texture, soil depth, drainage, forage type, precipitation, temperature, weed pressure, manure application history, and irrigation practices. For more information, see Appendix 2. Nitrogen application should be coordinated with appropriate temperatures, moisture availability, and the need for an increase in forage yield. Nitrogen applications are not recommended in November and December, as N applied to cold, wet soils in winter can be leached beyond the root zone or washed off the fields in runoff before slow-growing plants can use the fertilizer. Winter to early spring (January to April). Proper N management is especially important during winter and early spring, as adequate N is needed to support rapid plant growth between April and June. Local temperatures impact the start date for winter/early-spring fertilization. For example, pastures in the warmer south-coast region may respond to N fertilizer applied in January or early February, while pastures in the cooler Cascade regions may not respond to N fertilizer applications until mid-March or early April. An N application timing schedule specific to pastures in subregions of western Washington and western Oregon is illustrated in Figure 4. Another site-specific factor that impacts winter/early-spring fertilization is precipitation and drainage. In western Oregon and western Washington, heavy rainfall may cause pastures to become saturated. On poorly drained soils, N applications must be delayed until there is no standing water and the soil water table has dropped enough to allow safe use of fertilizer application equipment. See the sidebar “T-Sum method for early-spring forage production on grazed pastures” for more information. Late spring to early summer (April to July). Intensively grazed pastures that are expected to produce a high level of forage through June should receive additional applications of N. For grass pastures, N fertilizer applications should follow each cutting or major grazing event, so multiple applications may be required. For grass/legume pastures, N fertilizer applications may be less frequent. After mid-May, apply N only if moisture is sufficient for additional growth. July applications are recommended only for irrigated coastal pastures. Late summer to fall (August to September). In western Oregon and western Washington, the pasture growing season begins when fall rains begin. Do not apply fall N if adequate rain does not fall until late October or if the air temperature drops below freezing in October, as these conditions will greatly limit fall tillering and growth. Many growers apply fertilizers to dry soil and note that the granules disappear before any rain falls, raising concerns that fertilizer N may have been lost to the atmosphere through ammonia volatilization. Although a small amount of fertilizer N may be lost this way, most of the “missing” N fertilizer has been dissolved by dew and has moved into the surface soil. Although limited use of N fertilizer in the fall can stimulate forage regrowth after fall rains, it is important to recognize that too much fall N can lead to vigorous plant growth that reduces winter hardiness. As temperatures decline in the fall, plants produce a type of “antifreeze” called proline. This antifreeze accumulates in every living plant cell, but only when excessive N is not available. Thus, excess N inhibits plants from preparing for winter, leaving them susceptible to injury or death from the first major cold event. Other factors may increase N requirements above recommendations in this publication, including low soil organic matter content (less than 2 percent) and harvesting of forage for hay. Factors that can decrease N requirements below recommendations include a history of manure or biosolids applications, N recycling from intensive grazing, high soil organic matter content (greater than 4 percent), and anything that limits plant growth (weed pressure, high water table, acidic soil conditions, extreme weather conditions, etc.). Annual N recommendations are provided in Table 3 to give a general idea of the amount of N needed for optimal growth. However, because so many factors influence N management in pasture systems, you should expect to adjust these values as needed to reflect your specific situation. The N recommendations in Table 3 are based on those found in Pasture and Grazing Management in the Northwest (PNW 614). For information on estimating yield potential, see Appendix 2. Common granular N fertilizers for pasture include urea (46-0-0) and ammonium sulfate (21-0-0-24S). Common liquid fertilizers include urea-ammonium nitrate (32-0-0) and ammonium polyphosphate (10-34-0). Some of the N from some granular or liquid N fertilizers can be lost as a gas (ammonia; NH3) during the first week after N fertilizer application to pasture. This type of N loss is of concern only with urea and fertilizer mixtures that contain urea (e.g., urea-ammonium nitrate). Fertilizers that do not contain urea (e.g., ammonium sulfate) do not lose a significant amount of N as NH3 gas. Losses of N as ammonia gas can be high (10 to 30 percent of N applied). However, on western Oregon pastures, losses typically are less than 5 percent of N applied. Irrigation or rain (more than 0.5 inch) within a few days after application moves urea into the soil and reduces the amount of N lost as gas. Newer N fertilizer products include additives to reduce ammonia loss following fertilizer application. Products such as polymer-coated urea or urea treated with a urease inhibitor (e.g., Agrotain) can reduce ammonia loss from surface-applied urea. However, they are unlikely to routinely prevent enough NH3 loss to justify their extra cost. The risk of NH3 loss is highest with early-fall N fertilizer applications to dry soil, so fertilizer additives that reduce ammonia loss are most likely to provide benefit under these conditions. Nitrogen fertilization is the most important driver for soil acidification (decreased soil pH) in pastures. The most acidifying fertilizers supply all of their N as ammonium-N. Fertilizers that supply some N as urea are less acidifying per pound of N. Manure, compost, and other organic N sources are generally less acidifying than commercial N fertilizers, as they contain mostly organic N and also supply basic cations (Ca, Mg, K, and sodium). Soil Acidity in Oregon: Understanding and Using Concepts for Crop Production (EM 9061) provides a quantitative comparison of acidity produced by various N fertilizer materials in soil. 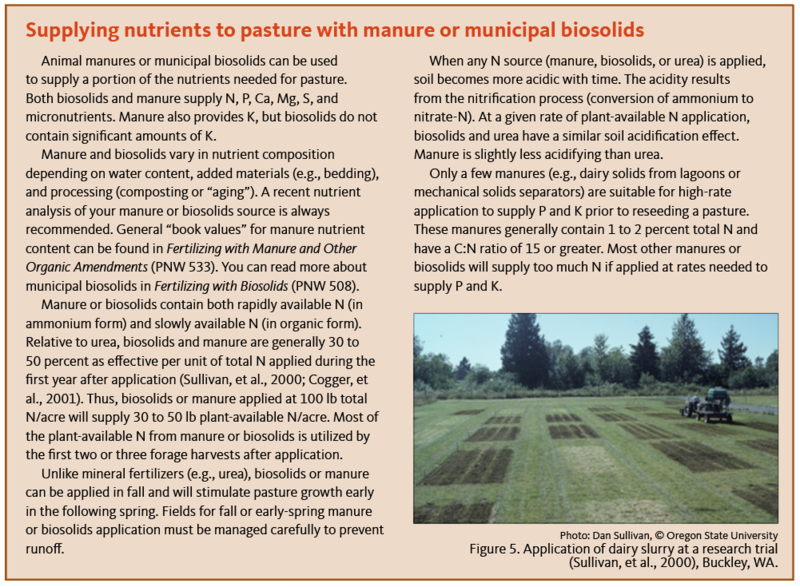 See the sidebar “Supplying nutrients to pasture with manure or municipal biosolids” for additional information about using organic materials to supply N for pastures. Not all “organic” sources are allowed under certified organic production rules (e.g., National Organic Program). Contact your organic certifier regarding appropriate organic sources. Adequate levels of soil P are important for root production in grass and clover pastures. Phosphorus applications favor legumes; therefore, they can be used to support legume growth in a grass/legume pasture. Visual symptoms of pastures with inadequate P include limited root mass and depth (which can be difficult to quantify without a comparison), stunted aboveground forage (short, small leaves), and a light to dark purple color on leaves and/or stems of both grasses and clovers. Because P binds to the soil, it can accumulate in the soil and does not need to be applied as often as N. Phosphorus accumulation can be documented with soil testing. 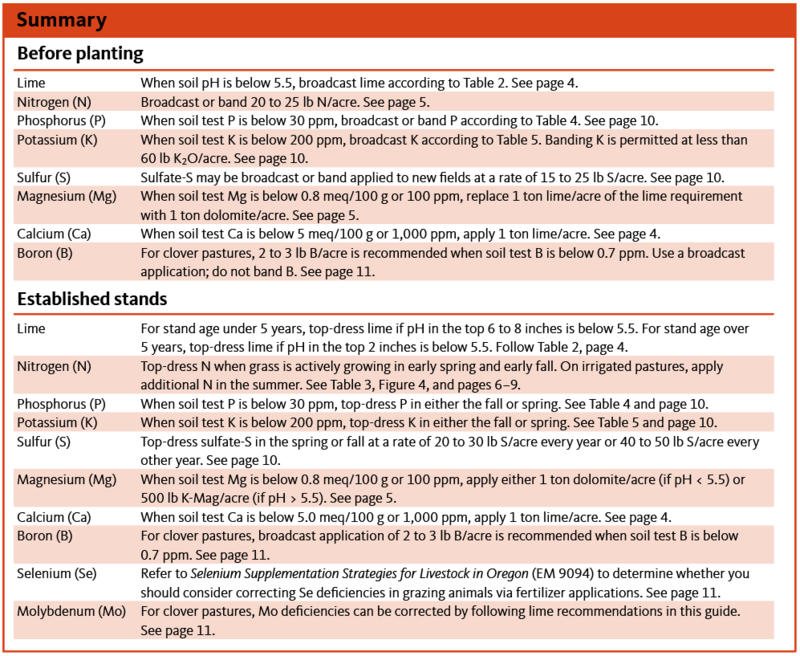 Recommendations for P application rates based on the Bray P soil test are provided in Table 4. For new seedings, P fertilizer may be banded with the seed or broadcast and incorporated prior to seeding. Band 1 to 2 inches to the side or below the seed to avoid burning newly emerging seedlings. For established fields, P can be applied in either the fall or spring. Fall P applications can be advantageous, as pasture grasses are developing their primary growing points and roots at this time. Spring applications can also be useful, as cool spring temperatures and acidic soil conditions reduce P solubility, thus inhibiting new root development and P uptake by plants. In either case, apply P to established pastures before growth begins. Potassium supports water transport and metabolic function in pasture plants and, therefore, is essential for optimal growth of clover/grass pastures. Potassium is particularly important for legume species, as grasses compete with clovers for K.
High-producing pastures can rapidly decrease soil test K values. Potassium deficiency is indicated by light-colored spots around the margins of clover leaves and yellow to brown coloring of grass leaf tips. However, growth responses to K fertilizer often can be obtained before deficiency symptoms are detected. If you apply K-rich animal manures to your pasture, be mindful of the potential for excessive levels of K, which can lead to grass tetany issues for grazing animals. Potassium fertilizer guidelines are found in Table 5. For new pastures, broadcast K and incorporate into the seedbed prior to seeding. If the soil test is below 125 ppm, band an additional 20 lb K2O at the time of planting. Potassium can be banded with N and P. If fertilizer is banded, application rates should not exceed 100 lb N + K2O/acre to avoid seed germination issues caused by salt burn. At least 1 inch of soil should separate the seed and fertilizer. Note that K fertilization at planting will not meet the need for K in subsequent years. For nonirrigated established pastures, apply K in the fall or spring, following recommendations in Table 5. In high-yielding irrigated pastures, split applications (late spring and midsummer) are recommended to reduce K-induced Mg deficiencies that may lead to grass tetany. For more information, see the sidebar “Grass tetany” or “Spring Pastures—Grass Tetany and Bloat” (http://www.ansc.purdue.edu/beef/articles/GrassTetanyBloat.pdf). Plants take up S in the form of sulfate (SO4). For new fields, broadcast or band sulfate-S fertilizers at a rate of 15 to 25 lb S/acre. On established fields, top-dress S at a rate of 20 to 30 lb S/acre annually or 40 to 50 lb S/acre every 2 years. Sulfate-S fertilizers can be applied in fall or spring with good results. Figure 6 shows plant response to S application. Nitrogen fertilizer applications without adequate S fertilization can result in rapid decline of the clover component of a grass/clover mixture. An N:S ratio greater than 10:1 in a forage tissue analysis may indicate S deficiency. Sulfur-deficient plants respond rapidly to sulfate-S application. During the rainy season, plants can recover from S deficiency in 3 to 4 weeks following a broadcast sulfate-S application. Fertilizers containing sulfate-S include ammonium sulfate (24% S), gypsum (16 to 19% S), and potassium magnesium sulfate (21% S; often called K-Mag or Sul-Po-Mag). Fertilizer dealers also offer fused prills of urea-ammonium sulfate, such as Urea-Sul (33% N, 11% S). Sulfate fertilizers are not very water soluble, so they typically are not fertigated. Liquid fertilizer N:S mixes typically contain thiosulfate (S2O3); the most common is ammonium thiosulfate (12% N, 26% S). Sulfur can also be supplied as elemental S. Elemental S acidifies soil and slowly releases plant-available sulfate-S. To be an effective S source, elemental S must be applied well ahead of crop demand or be of very fine particle size (less than 0.1 mm diameter; Rasmussen and Kresge, 1986). Selenium deficiencies can be triggered by S applications. See PNW 614, Pasture and Grazing Management in the Northwest (chapter 3, “Soils, Fertility, and Nutrient Management for Pastures”) for more details. Legumes have a higher B requirement than grasses, as B is used to support root nodulation in legume crops. Too much B can be highly toxic to plants and animals. Therefore, apply B only if soil tests indicate a need. Do not exceed suggested rates. If the soil test for B is below 0.7 ppm, an application of 2 to 3 lb B/acre is recommended. Spring applications are preferred because B, like N and S, can leach. However, fall applications are also appropriate. To avoid acute B toxicity issues, never band B-containing fertilizer materials. Distribute B evenly over the field. Solubor (sodium borate) is a suitable source of B. It can be applied evenly over a field via spray application. Dry B fertilizer can be mixed with other fertilizers. However, be aware that crop damage can occur if too much B is added or if B is not evenly dispersed throughout the fertilizer blend. Selenium is not an essential plant nutrient, but it is an essential nutrient for animals. A variety of methods can be used to provide Se to animals, including applications of Se-enriched fertilizers to pastures and forage crops. To learn more about strategies for providing Se to grazing animals via Se fertilization, see Selenium Supplementation Strategies for Livestock in Oregon (EM 9094). Molybdenum is used by legumes to facilitate N fixation. Existing Mo in the soil becomes more plant-available as pH increases in acidic soils. Therefore, liming to maintain soil pH above the recommended threshold (pH 5.5 for most pasture species) is an effective way to ensure adequate Mo supply. If soil acidity can’t be overcome with lime applications, and tissue Mo is below 0.3 ppm, legumes may benefit from an application of 0.4 lb Mo/acre. Molybdenum can be applied in a foliar spray as sodium molybdate. Keep in mind that an application of Mo will correct only Mo deficiency issues. It will not correct Mn toxicity, Al toxicity, P deficiency, Ca deficiency, Mg deficiency, or other issues caused by acidic soil conditions. Therefore, liming is the best way to correct Mo deficiency issues, as it will correct these related problems at the same time. Molybdenum toxicities in livestock, or molybdenosis, can occur when Cu:Mo ratios in forage tissue are below 2:1. While uncommon, this problem can occur on fields low in Cu that receive excessive Mo applications. If you suspect Mo toxicities, monitor forage concentrations of Mo and Cu. To learn more, see Meyer, et al., 1999. Although growth rates are influenced by temperature, moisture, solar radiation, and overall soil fertility, grazing management has a profound impact on pasture production. Plant growth phases are used to describe pasture growth and the potential for forage production (Figure 7). Phase I (lag phase), Phase II (vegetative or log phase), and Phase III (maturity or senescence phase) describe the stages of growth and their impacts on grazing and forage production. In Phase I, plants grow slowly because they lack sufficient leaf area for photosynthesis. In western Oregon and Washington, a pasture with less than 3 inches of plant height is considered to be in Phase I and should not be grazed until growth exceeds 3 inches. Keeping pasture plants in Phase I greatly reduces their response to nutrient application. It also can have negative effects on animals, such as grass tetany in the spring or weight loss due to low forage intake. If the pasture is constantly overgrazed throughout the growing season, it will not transition out of Phase I into more advanced growth phases. Phase II (3 to 12 inches of growth) is desired in pastures. Plants grow most rapidly and efficiently in this stage. When grazing animals reduce pasture height to 3 inches, move the animals to another pasture with adequate growth. The resulting rest period will allow for regrowth in the first pasture. Managing pastures in this manner, referred to as a rotational grazing system, allows plants to develop sufficient leaf area for efficient use of sunlight. During hot weather, leaving 4 inches of growth will reduce soil temperatures as much as 10°F compared to an overgrazed pasture in Phase I. It is important to maintain pastures in Phase ll during the critical late-summer and early-fall period. Two major plant activities occur during this period: root regeneration and formation of shoots (growing points) for the following year. Overgrazing or excessive forage harvest inhibits root system rebuilding and the formation of shoots for spring growth, resulting in reduced forage production during the next growing season. Allowing plants to store carbohydrates in the fall is also essential for long-term pasture production. Finally, the insulation from taller forage keeps plants growing later in the fall and helps start growth earlier in the spring. Do not graze plants below 3 inches in late summer and fall, even if the plants are dry and dormant. Grazing below this height will reduce forage response to a T-Sum 200 N application the next year. Phase lll (greater than 12 inches, varying by species and variety) is the reproductive phase. During this phase, plant growth slows, the lower leaves become shaded and die, and the seedhead emerges. Grazing efficiency is reduced due to trampling, the response to nutrient application is reduced, and animal performance suffers. The most efficient use of Phase III pasture is as conserved forage, such as hay or silage. With the major perennial grass and legume pasture species grown on the westside, regrowth will emerge following a hay or silage harvest, assuming nutrients and water are adequate. Plants will again progress through Phase I and Phase II if conditions allow. The ability to manage pasture species strictly as pasture or in combination with one or more hay or silage harvests is one of the greatest attributes of westside pastures. By estimating a pasture’s realistic yield, you can determine the amount of N needed to support optimal forage quality and yield. Yield potential is influenced by soil texture, soil depth, drainage, forage type, precipitation, temperature, weed pressure, manure application history, and irrigation practices. Realistic yield estimates are based on the estimated average yield from a 3- to 5-year period. Estimating forage yield is more challenging in grazed systems than in row crop systems because the forage is not collected at a single harvest event. A variety of methods can be used to estimate forage yield in a grazed pasture. One simple method uses a combination of animal units and bale yield estimates. Table 6 shows examples of estimated grazed yield, based on animal type and typical grazing periods in western Oregon and western Washington. 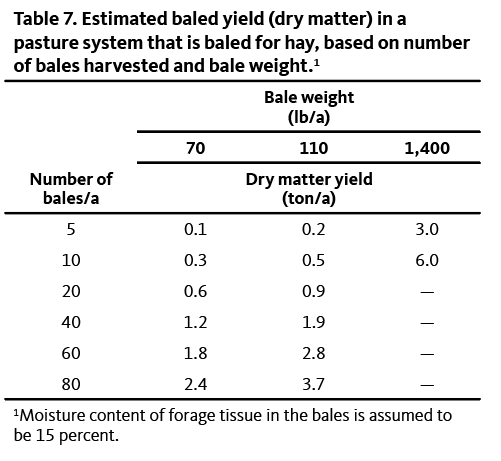 Table 7 lists examples of estimated baled yield, based on bale size and number of bales harvested per acre. Other methods of estimating yield include the clipping method, the rising plate method, and the pasture ruler method. These methods are based on relatively direct measurements of plant growth or biomass content over the production season. Therefore, they are more labor intensive but potentially more accurate than the animal yield/baled yield calculations described above. To learn more about these methods, see Hall, 2007. For example, if the high for January 1 is 11.7°C and the low is 4.4°C, the number of heat units for that day is 8.1 (11.7 + 4.4 ÷ 2 = 8.1). T-Sum calculations are available online from OSU Integrated Plant Protection Center (http://uspest.org). You can see degree day accumulation on a regional map or estimate T-Sum for a specific weather station using an online degree day model. Some online degree day calculators use degrees F; in this case, T-Sum 200 occurs when 360 degrees F have accumulated (1°C = 1.8°F). Cogger, C., A. Bary, S. Fransen, and D. Sullivan. 2001. Seven years of biosolids versus inorganic nitrogen applications to tall fescue. Journal of Environmental Quality 30:2188–2194. Hall, M. and A. Deak. 2007. Determining Pasture Yield. UC197, Pennsylvania State University. Koenig, R., M. Nelson, J. Barnhill, and D. Miner. 2002. Fertilizer Management for Grass and Grass-Legume Mixtures. Utah State University Cooperative Extension. Rasmussen, P. and P. Kresge, 1986. Plant response to sulfur in the Western United States. In Sulfur in Agriculture (pp. 357–374). M. Tabatabai (ed.). Monograph 27, American Society of Agronomy. Sullivan, D., A. Bary, D. Thomas, S. Fransen, and C. Cogger. 2002. Food waste compost effects on fertilizer nitrogen efficiency, available nitrogen, and tall fescue yield. Soil Science Society of America Journal 66:154–161. Sullivan, D., C. Cogger, A. Bary, and S. Fransen. 2000. Timing of dairy manure applications to perennial grass on well-drained and poorly drained soils. Journal of Soil and Water Conservation 55:147–152. Downing, T. 2018. Case study: Documenting grass growth and productivity in a grass-based organic dairy in Oregon. The Professional Animal Scientist 34:144–147. Bittman, S. and C. Kowalenko. 1998. 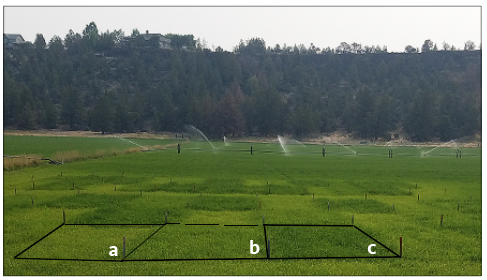 Whole-season grass response to and recovery of nitrogen applied at various rates and distributions in a high rainfall environment. Canadian Journal of Plant Science 78(3):445–451. Jackson, T. 1960. Making forage fertilization profitable in the Northwest. In Forage Fertilization Pays. Special Publication of the American Potash Institute. Jones, M. 1974. Fertilization of annual grasslands of California and Oregon. In Forage Fertilization. American Society of Agronomy. Jones, M., V. Rendig, D. Torell, and T. Inouye. 1982. Forage quality for sheep and chemical composition associated with sulfur fertilization on a sulfur deficient site. Agronomy Journal 74(5):775–780. Kowalenko, C. 2004. Response of forage grass to sulphur applications on coastal British Columbia soils. Canadian Journal of Soil Science 84(2):227–236. Kowalenko, C. 2009. Availability of single spring applications of three sulphur fertilizer sources to grass under humid weather conditions. Canadian Journal of Soil Science 89(4):511–519. Kowalenko, C. and S. Bittman. 2000. Within-season grass yield and nitrogen uptake, and soil nitrogen as affected by nitrogen applied at various rates and distributions in a high rainfall environment. Canadian Journal of Plant Science 80(2):287–301. Kowalenko, C., S. Freyman, D. Bates, and N. Holbek. 1989. An evaluation of the T-Sum method for efficient timing of spring nitrogen applications on forage production in south coastal British Columbia. Canadian Journal of Plant Science 69:1179–1192.